On September 11th, 2001, the lives of the people of New York and America were forever changed. As the twin towers collapsed, a wave of horror swept throughout the world. For the families and loved ones of the victims, the nightmare would not end on that day. Working in Lower Manhattan on 9/11, author William Kinsella experienced the results of the tragedy. 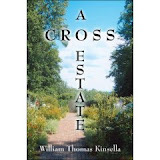 In his novel, A Cross Estate, Kinsella shares a fictional story of how one victim’s family and loved ones endured the devastating aftermath of that day. As a recent graduate from Duke University, Jack Conroy, a bright, spiritual, and compassionate young man, is faced with a difficult life choice. He must choose between following in his father’s footsteps and embark on a career on Wall Street, or, work as a Landscape Designer in Durham. Jack, passionate and feeling a spiritual connection with nature, is drawn to the nursery job as it would keep him closer to his girlfriend Veronica. Jack, deeply in love with Veronica, finds himself in a situation he did not imagine as a young boy dreaming of working on Wall Street. With the advice of his family and Veronica, Jack attends a job interview. At the interview, he starts to remember the reasons why he always wanted to work on Wall Street. He accepts the job and begins working for a company in the South Twin Tower. On 9/11, the death of Jack brings the lives of his family and Veronica to a standstill. From here, the story enters the lives of Jack’s loved ones. Jack’s mother, father, and Veronica, each undergo a painful struggle to deal with the loss. The reader is taken into their journey of hopelessness, pain, grief, depression, and losing the will to live. Only in the journey to their deepest and darkest feelings are they able to find the light. The journey of Jack’s loved ones is an emotional and painful one where nature with its remarkable beauty is entwined with such themes as birth, death, and rebirth. A Cross Estate is an emotional story of survival and finding peace amid a terrible tragedy. With a well-detailed depiction of setting and nature, William Kinsella delivers a story of hope from a terrible event that affected the loved ones of one special young man lost on that fateful day. I highly recommend the book to readers who enjoy powerful stories of love, loss, forgiveness, and redemption. To understand how and why we got here, one has to look at the history of how we evolved to the bipedal, upright, and thinking species that we are today. 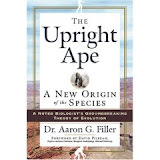 In his book, The Upright Ape: A New Origin of the Species, biologist and neurosurgeon Dr. Aaron Filler proposes that a key element to unfolding the mysteries that have challenged evolutionary biologists for centuries lies within our bones, particularly the spine. Dr. Filler explains that to fully understand evolution, we must study the early pioneers of evolutionary theory and the influence of their era’s philosophical, religious, and cultural beliefs. Filler proposes that although Darwin’s theory of evolution is a key element to understanding evolution, the concept of a slow process of descent with modification is not the final conclusion of our evolutionary story. By examining the works of a number of evolutionary pioneers such as Johann Wolfgang von Goethe and Etienne Geoffroy Saint-Hilaire, Dr. Filler is able to build on their early findings and show through his own research that locomotion and the development of the spine is a key feature to understanding how humans evolved. Drawing on such works of Mendel’s Nature of Heredity as well as Pre-Darwinian and Post-Darwinian researchers, Filler proposes that evolution had the ability to accelerate, even in an instant. Using modern technology to study fossilized species, the bone structure of species such as the ape, fish, birds, as well as the human skeletal structure, Dr. Filler presents compelling evidence that the building blocks within the vertebrate embryo that initiate the formation of muscle, tissue and bone, are a common feature among the species. As well, he explains the bones and spinal segments that all vertebrates have in common. Although the various bones are located in different sections, the link among species indicates a common history with various evolutionary branches. That is, there is a common connection among species, but evolution is not a single straight path. It is more like a tree with various branches that contain common evolution building blocks. Filler proposes that the split between human and chimpanzee on the evolutionary ladder is the result of an upright ancestral ape with the apes we see today having evolved from a different evolutionary branch than humans. He explains in detail how the human spine evolved and how the modern ape is actually a descendant of humans. The Upright Ape: A New Origin of the Species is a compelling and well-presented analysis of the story of life. With an in-depth examination of evolutionary pioneers and their influences on today’s research, Dr. Aaron Filler presents a convincing theory of evolution that will educate, stimulate, and challenge our perceptions of the history of life. I highly recommend the book not only to science students, but to readers who enjoy engaging and well-researched books that inspire debate and reflection.